Hebrew is much more suitable for expressing the science of Kabbalah than any other language. It has a greater supply of suitable words that more accurately express an inner feeling. After all, the Hebrew language grew out of the science of Kabbalah. This science, its approach, the aspiration toward the Creator, created and formed the language. Therefore, Hebrew contains all the symbols to clarify the Creator. The form of the letters, the way they are written, the grammar, everything is adapted only for the purpose of explaining the essence of the desire in which the Creator can be perceived. There is no other language that can be compared with Hebrew in the expression of Kabbalah. Other languages do not have such properties. Question: I often listen to the Secrets of the Eternal Book TV program where you explain what each commandment means, and I try to understand how Kabbalists pass on this information. Why didn’t they put an explanation of every concept in parentheses? For example, Egypt (Mitzraim) is a concentration of evil, Pharaoh is the ego, and so on. Answer: There is a purpose for this—it gives a person freedom. As one develops, he can smoothly interpret all spiritual work either within our world or within the spiritual world in accordance with his growth. I also asked myself these questions, and tried to put it all out in my first books, at least in a very simple way. But there is no language in the world that can simply describe spiritual actions and everything that is written in the Torah. Question: How did the language of branches develop? Let’s say that a Kabbalist, upon investigating his egoism, discovered a “snake” in himself. Did he understand that the snake is a branch, while spiritual egoism is the root, and therefore called egoism a snake? Question: Whenever we reveal the Creator on a particular level, do we also reveal a certain “snake” within us in correspondence to it? Answer: The Creator has no image because it is just a property. A property can dress in matter, task it with certain actions, express itself through matter, but it has no image of its own. Let’s say you hear the word “beauty.” You imagine a person, or an animal, or a plant in such a way that there is a property called “beauty” in it. You cannot imagine an abstract beauty; you will always portray it in some object. Similarly, spiritual properties do not have any material vessels. But in order to depict or somehow convey them, you must express them through these vessels. Kabbalists understood that the spiritual property called a “snake” produces a corresponding property in our world. While they did not study botany, biology, or zoology, they wrote as if they were thoroughly familiar with the nature of different animals. My Comment: Even those that are already extinct as well as those that have not developed yet and will only manifest themselves in the future. Everything comes from the attainment of the spiritual world, for every spiritual root must produce its counterpart in our world. Question: Is the logic of our world preserved in spirituality? For example, does two plus two also equal four? Answer: In spirituality, the logic of our world is not preserved. There is no arithmetic there, but there are many other different calculations depending on what one is working with. We will have different mathematics on different levels. Question: Is spiritual arithmetic the Gematria of words? Is it related to the desire? Answer: Of course, because each letter in itself represents the combination of various proportions of the forces of bestowal and reception, each of which creates one particular basic form or another. That is why the 22 letters of the Hebrew alphabet are the basis. The first nine letters correspond to the nine Sefirot of Bina, the second nine letters are the nine Sefirot of Zeir Anpin, and the four final letters are the four Sefirot of Malchut. There are also five additional letters, which are formed from the Parsa. Question: Each element of the letters: the point, the horizontal line, the vertical line—are all these forces? Answer: Yes. A specific combination of forces of bestowal and reception represents letters. There is no other combination. The Creator created the desire to receive (the black point). During the desire’s development process, He was constantly exerting influence on it and gathering all possible combinations of His influence. That is why when the black point is reflected on the background of white Light, it depicts the correlation between the upper Light and itself, its desires. This creates the 22 patterns. The laws of Gematria are the same everywhere, the ten Sefirot do not change. But this is not reflected in the mathematics of our world. Gematria is one of the languages describing the upper world and its processes. This is the language of Kabbalah. Knowledge of Hebrew is very important in studying Kabbalah. It is unlike the sciences of this world, for example physics, which can be learned in any language. Kabbalistic terms in Hebrew directly correspond to spiritual vessels, lights, and actions. While reading the Kabbalistic text, we do not just read words, but go from desire to desire, revealing the Creator through the change of letters and their sequence. Each letter is a spiritual symbol, and each word is a matrix. It is like a special secret code, an encryption. Each word, letter, order of words, and the root of each word come from the relationship of lights and desires. The Hebrew language was created on this foundation. It is the only language that has arisen not for corporeal use, but has descended from Above to define relationships between lights and desires. Therefore, knowledge of Hebrew helps us penetrate deeper into the connection of light and desire, to feel its taste and understand why it is exactly the way it is. We can feel the harmony embedded in the Hebrew language and the internal interconnection of the forces of nature that are expressed through its letters. When translating Kabbalistic text to English or to any other language, the essence of the explanation that is included in the word itself is lost. Translation gives a more external understanding of the action, whereas the Hebrew word expresses the inner meaning of the desires, their connection between each other and with the light, and the form of filling. 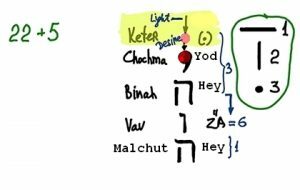 In addition to letters in Hebrew there are vocalization points, crowns over letters—TANTA (Ta’amim-Nekudot-Tagin-Otiot – tastes-points-crowns-letters)—which show how these properties begin to unfold. There are 22 letters in Hebrew: nine from Bina, nine from Zeir Anpin, and four from Malchut, and five more letters at the end of words, that is, the symbols standing on the Parsa. The exit of the light builds points (vocalizations) that disappear. Vowels are almost never used, they are just implied. Letters, points, crowns over the letters are all very important. They can reveal the entire wisdom. If we knew the inner meaning of the words and of the order of words and letters—all this is the entire revelation of the Creator to the created beings. Question: An ordinary person understands the earthly manifestation of love for a mother and children. Can he learn something from this in terms of achieving spiritual love? Answer: I would not advise engaging in psychology, especially like with a mother and children. I quite often give this example only because it is real, but not more. That love that we achieve among ourselves in the group is not like that at all. It is special. It is built on the balance of opposites. Question: Meaning, what a person knows about love and hatred from his life experience has nothing to do with the love that Kabbalah speaks about. Why haven’t the Kabbalists chosen another word to express this concept? Answer: In order to explain the upper world, Kabbalists use the language of our egoistic world, what is called the “language of branches.” There is no other way. We take the definitions of objects and phenomena of our world and with their help describe the upper world as existing on the mutual balance of two opposite properties. This is not our world at all. We will need to try very hard to find the right interaction among ourselves to learn what the construction of the right spiritual relationship and love are. Question: What is the principle of the name HaVaYaH—the four-letter name of the Creator? Answer: Kabbalah came to us from Adam—a man who lived 5,777 years ago. He was the first to disclose and describe this science of the upper world, about the governing system of the whole universe and us. It has been developing since then. “Kabbalah” in Hebrew means “to receive.” After Adam, a whole school emerged whose representatives called themselves Kabbalists, that is, those who “received” the higher knowledge about the governing system of our world. Adam revealed that two forces operate the world: the negative and the positive. They are opposite to each other but work in harmony with each other and form all kinds of connections and interactions. One of them is the quality to bestow (1); the second is the quality to receive (2). A horizontal line denotes the quality of bestowal, and the vertical line is the quality of receiving. In addition to them, there is a point (3), which signifies the beginning of creation. The whole universe consists of these three elements. With their help, you can express any combination of forces, the state of any element of creation. Therefore, when we say that the upper Light acts, we mean that it acts upon the point. 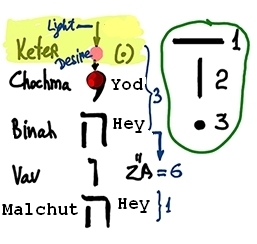 The impact of the upper Light from Keter, which is still without any form, on the desire (the red dot) leads to the emergence of the initial point of the letter “Yod,” which then grows into a special tail denoting the further spreading of Light. That is, from the point (the quality of Keter) the letter “Yod “(the quality of Hochma) is acquired. Continuing to evolve, the Light turns into a very interesting system, called “Hey”—a special letter or sign. It is how a special property—Bina appears, which changes to be similar to Keter. This, in fact, is the desire to receive, which while in Keter is just a point and must acquire the form of the letter “Hey” to become like Keter. Further distribution of the letter “Hey” forms the letter “Vav” (Zeir Anpin), and the second letter “Hey” (Malchut). Thus, Adam revealed that the governance of the entire system of the universe occurs through combinations of two forces and they are graphically depicted. He derived forms of interaction between the force of bestowal, the force of receiving, and the point, and discovered only 22 forms of interaction in nature, the so-called “22 letters” plus five final letters that denote the endings of all influences. These comprise theHebrew alphabet. The alphabet is an image of all possible combinations of two forces that exist in the universe. Today, science reveals that this is the very first alphabet in the world. It came to us from the first man. And by the first, it doesn’t mean the first person on Earth, but the first one who revealed the upper system of governance. Therefore, he is called, Adam. Question: Does war have a spiritual root? Answer: There is nothing in our world that does not have a spiritual root, otherwise the object or phenomenon would not exist. The forces that came down from the spiritual world, from the upper system of governance and integration of forces, gradually materialized and formed various objects in our world. That is why it is written: “You haven’t a blade of grass below that has not a fortune and a guard above that strikes it and tells it, ‘Grow’!” This is obvious. Upper forces that come down from the world of Infinity through the worlds of Adam Kadmon, Atzilut, Beria, Yetzira, and Assiya reach our world and materialize here. However, if we are talking about the upper root, in regard to its branch in our world, then it is difficult to explain anything because the system is completely confused. For example, how can you relate a cup or a human hand to an upper equivalent? Moreover, our world has no such equivalents! It is merely the forces that depict them in our consciousness, in our perceptions. Although, we think that they are material objects, they are illusions.